As you probably are aware, Intel disclosed a CPU Speculative-Execution vulnerability (called L1 Terminal Fault) on August 14, 2018. Like many others who work with VMware vSphere environments, I read up on the remediation steps (KB 55683) so I could patch my small lab environment. 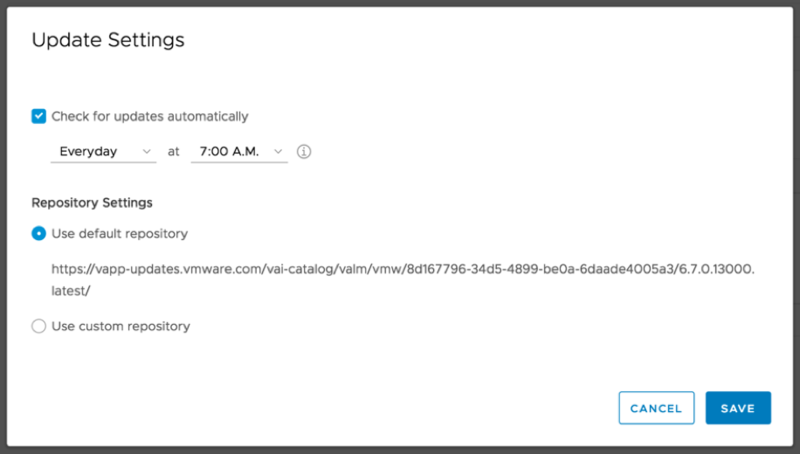 For my vCenter, I was excited to use the VAMI Update functionality for the first time! I logged into the Virtual Appliance Management Interface (or VAMI) by pointing my web browser at the IP of my vCenter Server Appliance using port 5480 (for example: https://myvcenter.lab.net:5480) and navigated to the Update tab. I hit the Check Updates button with the option to check the CD ROM and URL; but to my confusion no updates appeared in the list. I double-checked KB 2143838 which is the list of vCenter Server build numbers to ensure a new release was available. Sure enough – vCenter Server 6.7.0d was released on 8-14-2018. To configure the VAMI with this custom URL, login to the VAMI for your VCSA, and navigate to Update, and click on Settings. 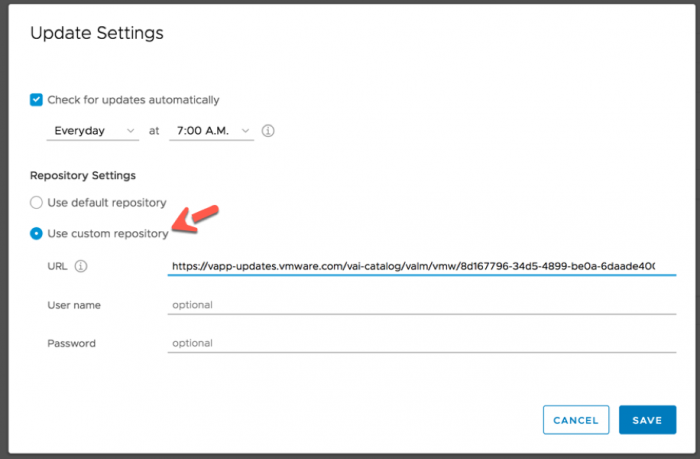 Click on the Use Custom Repository option, where you can apply the URL from the VMware Knowledge Base article listed above. If the User Name or Password fields have any information in them – blank that out. Click Save. The dialog will disappear. In my lab, the new patch appeared automatically. If you don’t see one, click Check Updates (CD ROM & URL). If you click the RUN PRE-UPDATE CHECKS link, it will look for issues that may cause problems in the upgrade process. Since my checks passed, I clicked the STAGE AND INSTALL option above the patch list and the upgrade finally began! NOTE: I did take a snapshot of the VCSA VM before doing any of this work! If you haven’t updated your VCSA before using the VAMI, you can see a walkthrough of the remaining screens below. The process is very simple – a few checkboxes and Next/Finish clicks! You are backing up your vCenter – right?! With VCSA 6.7 it is very easy and can be scheduled. In my lab, the process only took around 30 minutes. It was so easy – particularly in comparison of the days of updating a Windows-based vCenter Server. Just another reason I love the vCenter Server Appliance! OMG! Been banging my head against the wall trying to figure out why it wasn’t showing any patches, cant believe I had to scour the WWW to find your article. Thanks so much. Why must VMware hide this info so well? Awesome! Thanks! I too have been doing a lot of head-banging. This was the fix.